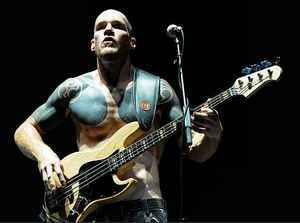 Timothy Robert Commerford (born February 26, 1968 in Irvine, California), also known by his various monikers/stage names (Timmy C, Y. tim K., Simmering T, Tim Bob, and tim.com) is the bassist/backing vocalist for American alternative metal band Rage Against The Machine and the now-defunct supergroup Audioslave. Simmering T., Tim Bob, TIM.COM, Y.tim.K. Commerford, Simmering T., T. Commerford, T. Cummerford, T. Cummorford, Tim Bob, Tim C., Tim Commeford, Tim.Com., Timmy C, Timmy C., Timothy Commerford, Timothy Robert Commerford, y. tim. k, Y.Tim.K, Y.tim.K.